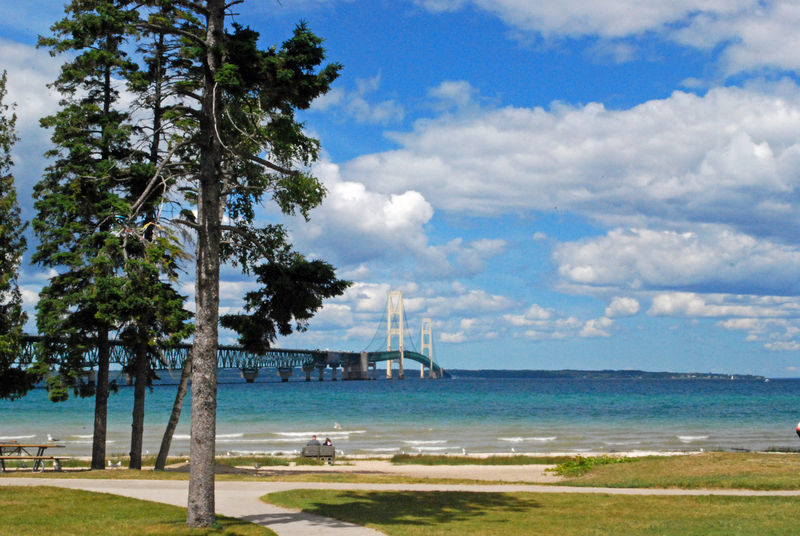 Michigan: Mackinaw and “The Bridge”. Mackinaw Michigan lies on the uppermost tip of Michigan. It is the gateway to the Upper Peninsula and Mackinac Island. The light House makes for a safe journey for ships navigating the treacherous waters off the coast in Lake Huron as water flows into it from Lake Michigan and Lake Superior. 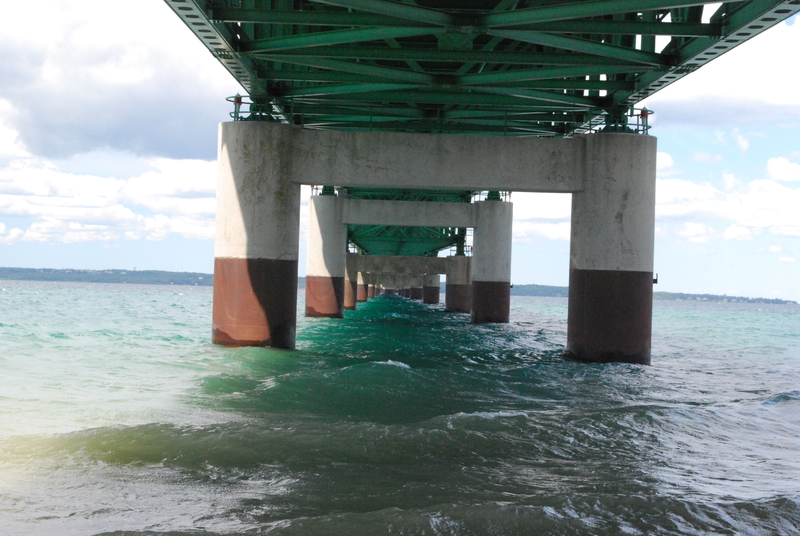 A sight not often seen, the undercarriage of the Mackinac Bridge. 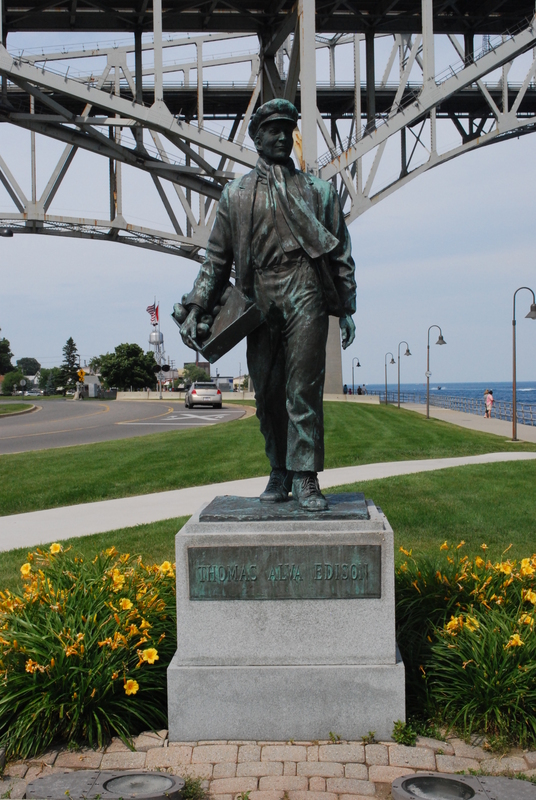 During summers, the Upper Peninsula and the Mackinac Bridge have become a major tourist destination. In addition to visitors to Mackinac Island, the bridge has attracted interest from a diverse group of tourists including bridge enthusiasts, bird-watchers, and photographers. The open field adjacent to the bridge is a wonderful spot to relax and enjoy the view. 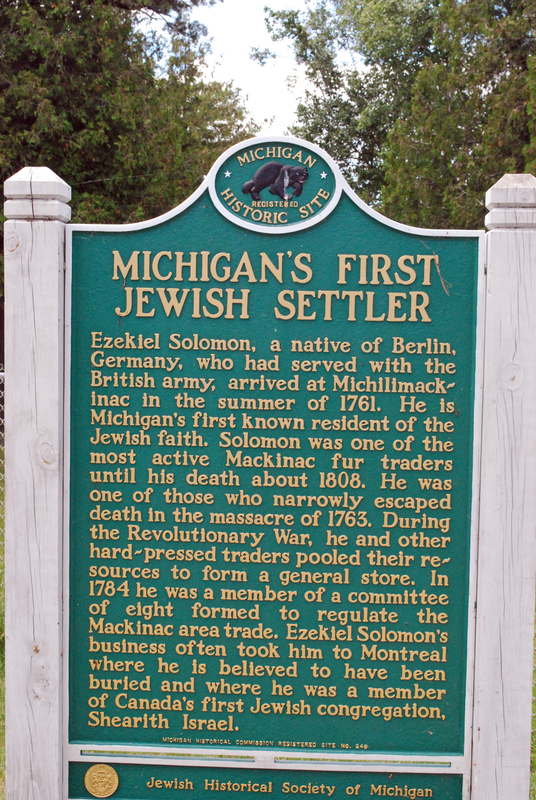 Ezekial Solomon was reportedly the first Jewish settler in the state of Michigan. The fur trade played an important part in the early settlement of Michigan. Dubbed “The Crossroads of America” Indiana has long been at the “center ” of things since the very beginning. Located near the center of the country, at one time everything and everyone who transversed our land had to pass through Indiana. That has changed over time, but Indiana still is prominent in the transportation system of the United States. It has a rare beauty not found anywhere else. Looking past all the corn fields, there is much to see. 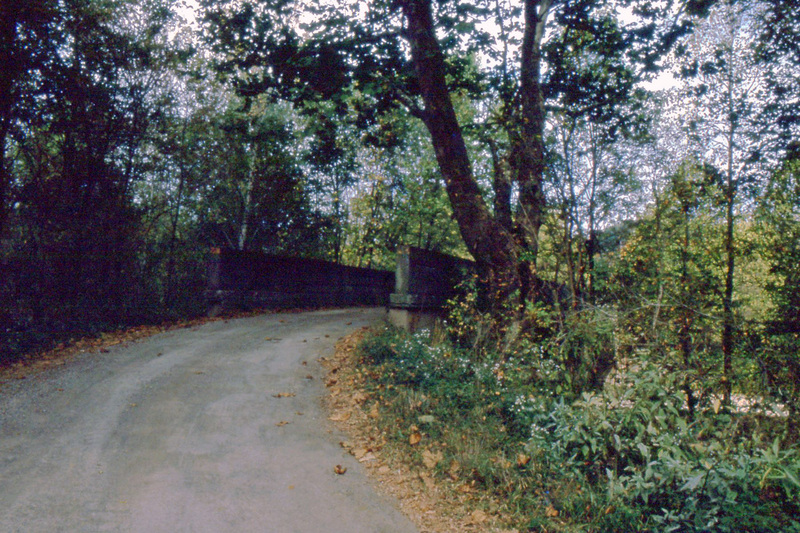 This bridge, located on a country road, named Cave Hill Road in southeastern Indiana, crosses Laughery Creek between Friendship and Versailles. In a desolate and hard to find location, except for local travelers, very few people know it even exists. 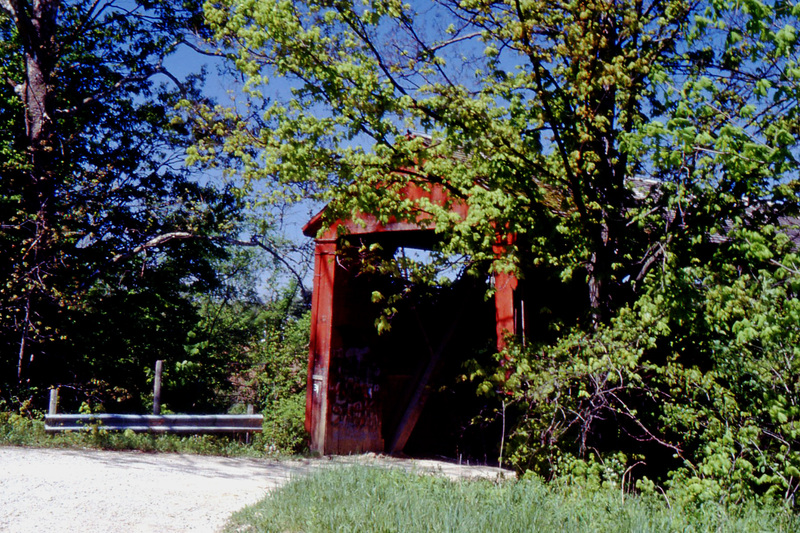 The Enochsburg Bridge is another unknown bridge. It is just east of Enochsburg in Decatur County in southeastern Indiana. It provides a crossing across Salt Creek, enabling one to take a back road to either Oldenburg or Batesville. The Hahn Reservoir, a city lake that supplies water to the city of Batesville. 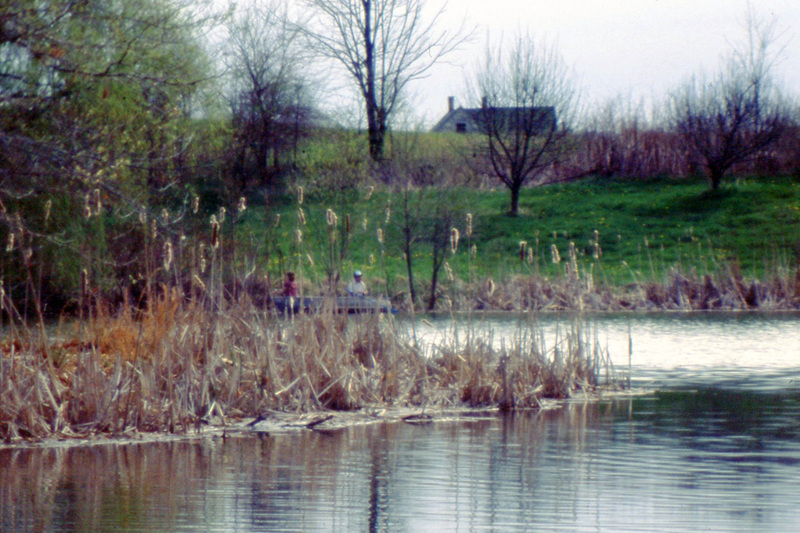 Lake Santee, a manmade lake that lies between Greensburg and Batesville, just north of New Point and exit 143 on I-74. 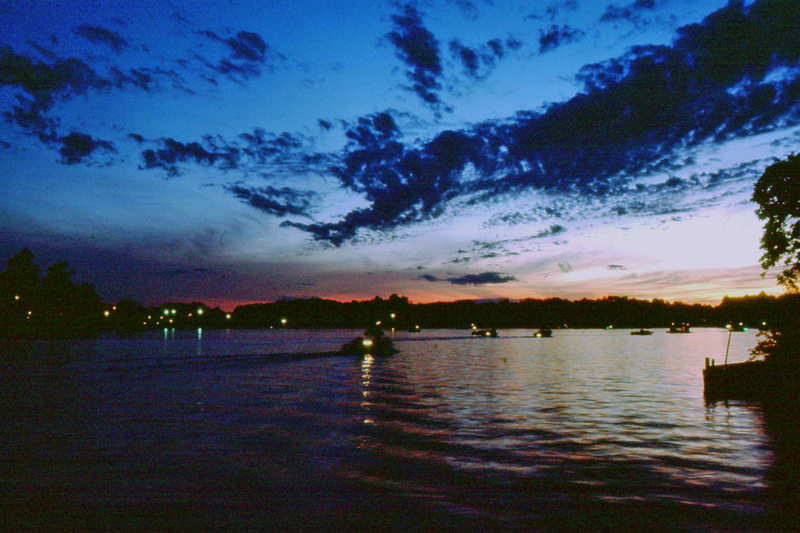 It is a 250-acre lake with excellent water skiing and fishing. Each generation from the beginning of our country has contributed to what our country has become. By the same token, no one is perfect. Consequently, each generation has done and will continue to perform acts that it would have been better if some other course of action was taken. The baby boomers have contributed much and have been blamed for the decline of America. What is the true story? 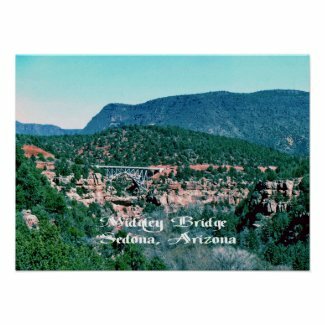 Located on the 89A highway leading into town from the north, Midgley Bridge has a nice viewpoint of Oak Creek and its valley below,but also provides a car park area to access a few trails. A few steps down from the car park will take you to a viewing area with guardrails from which you can admire the view of the river and valley leading into town. The bridge itself isn’t that photogenic, being a simple iron arch but I can imagine it being quite fun to bungee jump from! 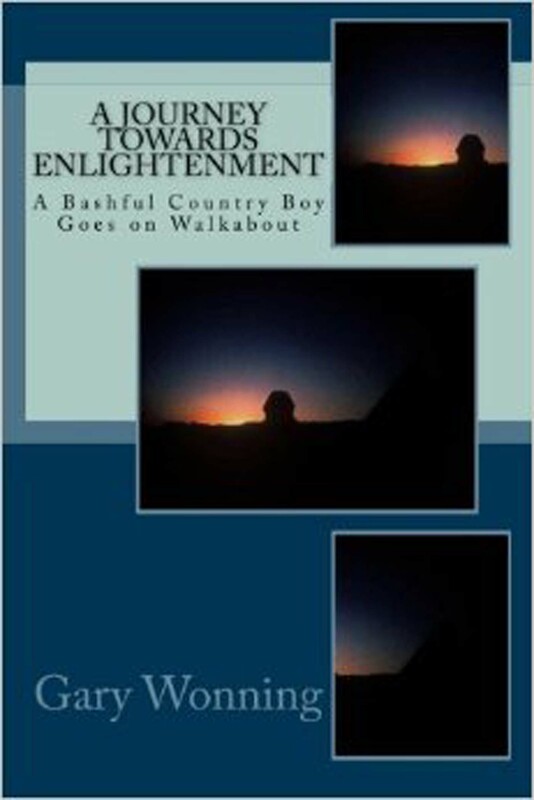 For more information and a link to his hard cover and Ebooks,and contact information: please check his website, http://www.journeysthrulife.com. In 1814, Fort Gratiot was established at the base of Lake Huron and was considered to be the first Euro-American population in the area. There was an Ojibwa reservation in part of the modern area of Port Huron until 1836. In later years Fort Gratiot was incorporated into Port Huron. 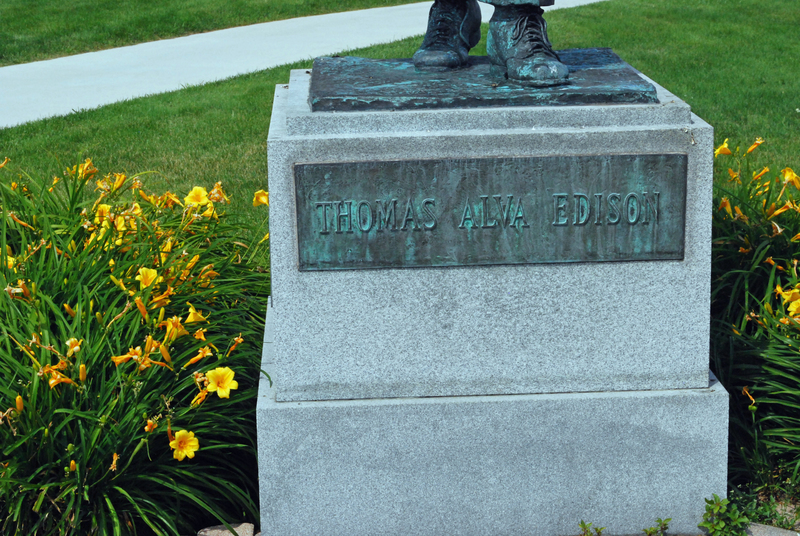 Port Huron was the boyhood home of Thomas Edison who moved here in 1854. 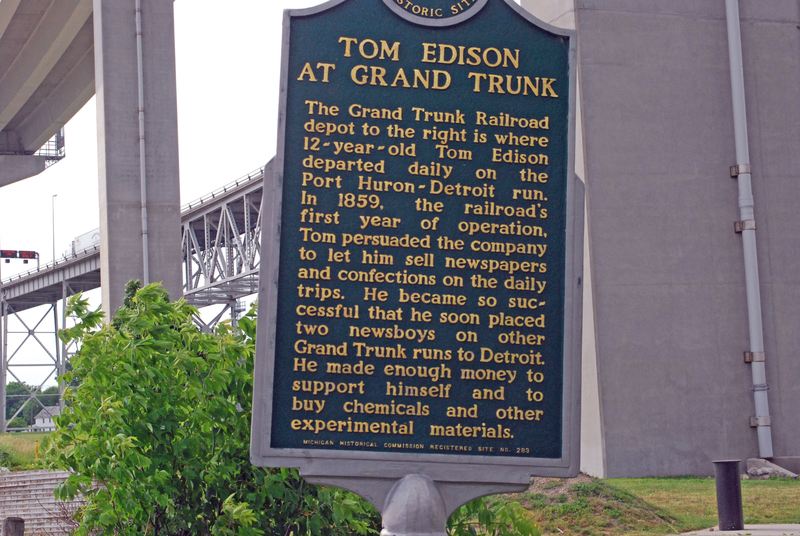 12 year old Thomas Edison rode the train daily to Detroit and back selling newspapers. He earned enough in a very short time to supplement his income and buy chemical and other items for his experiments. 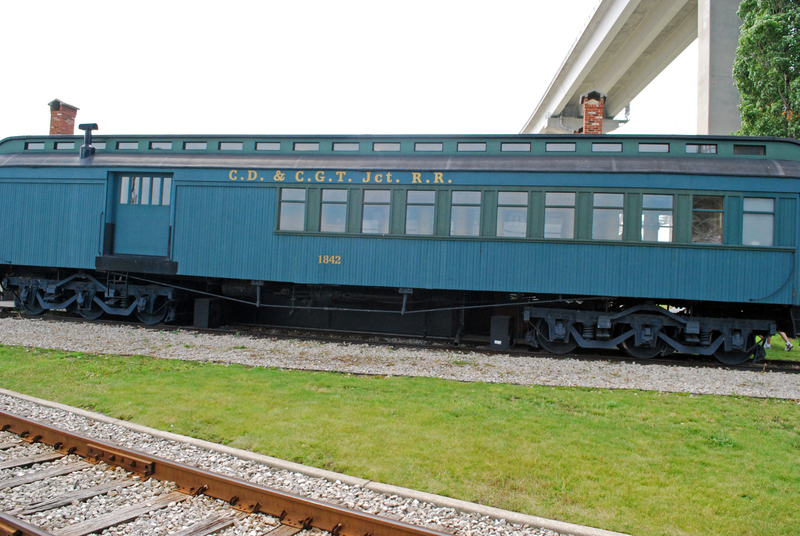 The Grand Trunk Western Railroad tunnel was opened in 1891 and links Port Huron with Canada. This international ,so called submarine railway tunnel, was the first international tunnel in the world. The tunnel’s total length is 6,025 feet , with 2,290 feet underwater. The tunnel operations were electrified in 1908 and then converted to diesel fuel in 1958. Tracks were lowered in 1949 to accommodate larger freight cars. During World War 1, a plot to blast the tunnel was foiled. In later years, a new tunnel was constructed. 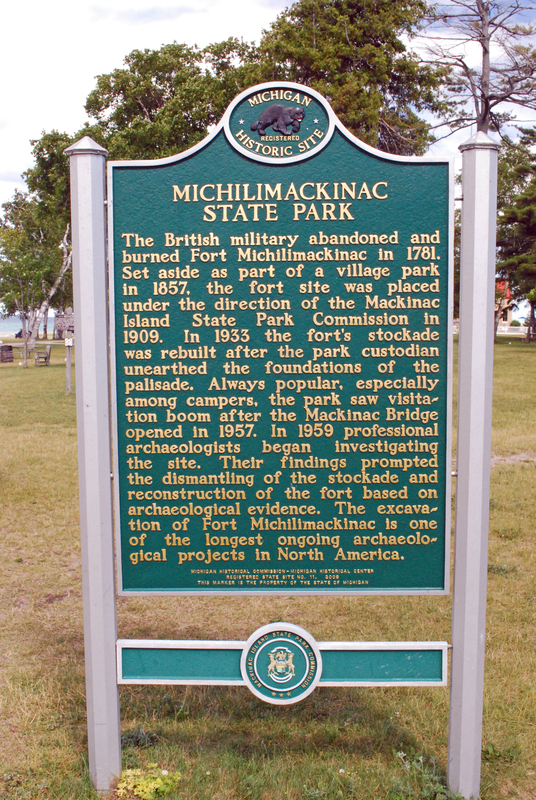 Michilimackinac is a name given to the region around the Straits of Mackinac between Lake Huron and Lake Michigan by the American Indians who originally settled in the area. Ezekiel Solomon a native of Germany was the first Jewish settler in this area. In the early days, the settlers of North America applied the term to the entire region surrounding Lake Huron,Michigan and Lake Superior. Today the name mostly applies to the area within the state of Michigan. 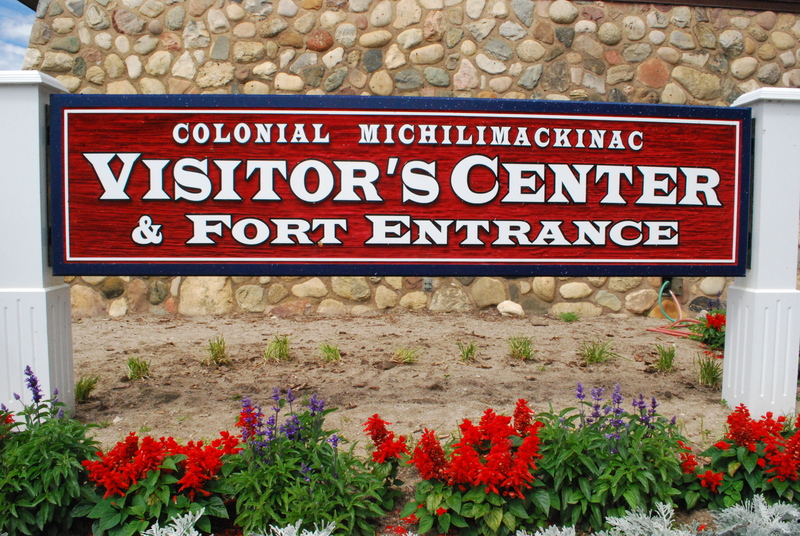 Today, Fort Michilimackinac is a tourist site. Re-enactors portray historic activities of the French and English. An archeological dig at the site is open for viewing. The Chippewa and Ottawa Indians were the first to inhabit the area, the French came in 1612 and established trading posts and missions. The French established the fort and was later taken over by the British after the French and Indian war. Today, Fort Michilimackinac is a tourist site. Re-enactors portray historic activities of the French and English. An archaeological dig at the site is open for viewing. 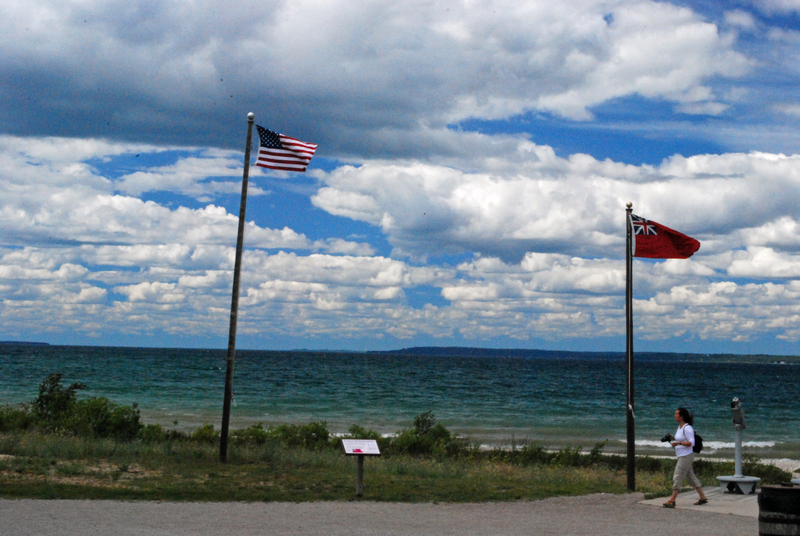 More than just a military outpost, the oldest public building in Michigan served as home to soldiers and their families, and eventually became home to the Mackinac State Park. The War of 1812 had it’s first skirmish on Mackinac Island when British soldiers surprised and captured the Amderican out post. Another great article about Mackinac Island and the surrounding area. About 15,000 years ago, Mackinac began to emerge as an Island in what is now known as Lake Huron, when the glaciers of the Ice Age receded. At least three different lake levels were known that helped to develop it as it is today. It is believed to be during the Nippissing post glacier period about 4000-6000 years ago, due to the erosive action of the ancient Great Lakes, that the cliffs and rock formations were created in the Breccia Limestone. As the Halite or rock salt washed away, caverns were left in the softer rock. Centuries ago, Lake Algonquin supposedly covered all but the center of Mackinac Island and left only what is known as Sugar Loaf protruding. It stood 75 feet above ground level and is the largest of the limestone stacks. The measurements are two miles wide, three miles long and eight miles around. As the years passed, birds dropped seeds and wild animals began to visit the Island, causing different fauna to begin to appear on the landscape. Clumps of trilliums, lady slippers, species of asters, forget-me-nots, violets, buttercups, a variety of orchids, jack-in-the-pulpits to mention a few, grew in the soil. Over 600 species of plants eventually appeared to grow on the surface. Trees of pine, cedar, spruce, maple, oak, elm, and more took root in the dirt and rocks. Birds began to come to roost in the branches of the trees and look for food along the shores. Herrings, ring billed gulls, blue herons, Canadian geese and loons, winter snow owls and the great grey owl from the Artic came to nest in the warmer climates surrounding the Island. Later on many species made their home on the Island such as the tundra swan, ospreys, purple martin, blue jays, orioles, warblers and many others. The first visitors were aboriginal Indians around 11,000 years ago in prehistoric times. After the last glacier – 4000-6000 years ago, Indians looked out over the Straits between the newly formed lakes and gazed at the high bluffs. Legend has it that it resembled a large reptile and called it Mich-la-mack-in-aw derived from the Chippewa and Ottawa language, Mi-she-mi-ki-nock, meaning big mud turtle. Their totem was the turtle. They looked at the Island in awe especially at the arch rock, which they believed was the gateway to the Island in which Gitchee Manitou (A Great Spirit) entered, to go to his home in Sugar Loaf Rock. They saw the Island as mystical and believed it to be sacred land. They buried their dead chiefs in the caves. Long before any white man set foot on Mackinac Island, the Anishinabe lived near the St. Lawrence Seaway. About 500 years ago, they received a vision that guided them to move to a new land. The vision ended where the two lakes met. The Anishinabe divided into three groups. The second group called the Ottawa, settled on Manitoulin Island. An independent small group of Indians lived on Mackinac Island. They roamed the woods and fished the lake that surrounded it. They set up their wigwams and made their encampments for trade or other business along its shores and rested there after long winter hunts. They held Jubilees and war dance. Their children played upon its sandy shores. The Ottawas thought them an interesting people and made a confederation with the tribe. However this small tribe had powerful enemies, the Iroquois of New York. One day in the dead of winter, when the tribe was celebrating a victory with a Jubilee over the conquest of the We-Ne-Be-Goes of Wisconsin, the Iroquois struck and almost annihilated them. Two of the small tribe escaped and fled and hid in the caves. This was thought to be the end of them. The tribal name was Mi-Shi-Ne-Macki-Naw-Go so the Ottowa and Chippewa named the island Mi-Shi-Ne-Nacki-Nong in honor of their former confederates and this is supposed to be the true origination of the Island’s name, Michimackinac, according to Chief Mack-e-te-be-nesay or Andrew Blackbird (Black Hawk) in a traditional story told in 1887. Oh, the stories that could be told over the centuries. Some are true but some may be just legends. Legends are told over the years but somewhere many have been based on actual facts. Take for the example, this story. It is the tragic story of a young Indian couple. I will call them Running Bear and Little Bird for lack of their real names. Running Bear was leaving on a raid on another tribe. Little Bird received news that he had been killed and wouldn’t be returning to her. In her grief for her lover, she threw herself off one of the high cliffs to join him in death. The tragic story is that she was wrongly informed and that he returned safely so that her death was in vain. Later people named this site as Lover’s Leap. Missionary’s quest for souls brought the Jesuits to the area. In 1671, Father Marquette founded a mission here. It was the first in the region replacing one founded three years earlier on Lake Superior’s shore at Chequamegon Bay. It later was moved to St. Ignace. Abundant fishing for centuries brought large populations of Indians to fish the lakes. Ottawa, Ojibway, French Canadians, Metis, Scots and German Jews conducted business upon the shores. Trading for furs brought the first white explorers. Beaver pelts were traded for metal knives, awls, kettles, steel flints, guns, ammo, blankets, and jewelry. Liquor was prohibited but unscrupulous men still gave it to the Indians for furs. Packs of thousands of pelts were shipped to Montreal and eventually to France and England where they graced the heads of customers. Desire for fur hats in the 17th and 18th century led the Canadians to establish supply networks. 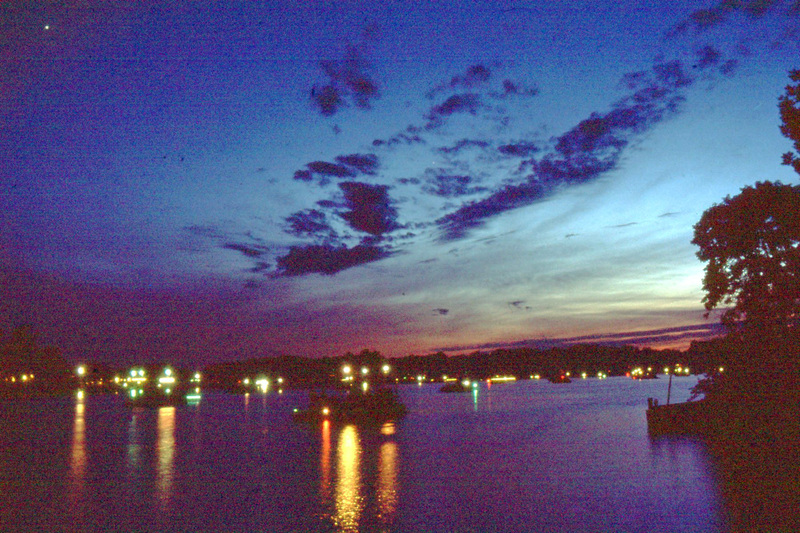 Mackinac Island was chosen to be the rendezvous point for this action. The traders and Indians came in flotillas of canoes for supplies for the next season but after business was conducted it was time for revelry. Their recreation was performing contests of great skill, along with many types of games, drinking good whiskey, gamboling, and the swapping of the tallest tales. It was a wild and heterogeneous assemblage of several hundred men, both savage and civilized that gathered every year upon the shores. The fur trade was so profitable that the English tried to win Indian suppliers away from the French. Forts were built to protect the fur trade and to make sure the government got its share. Furs were the lifeblood of the French, the main lively hood of the British and of great economic importance to the Americans. 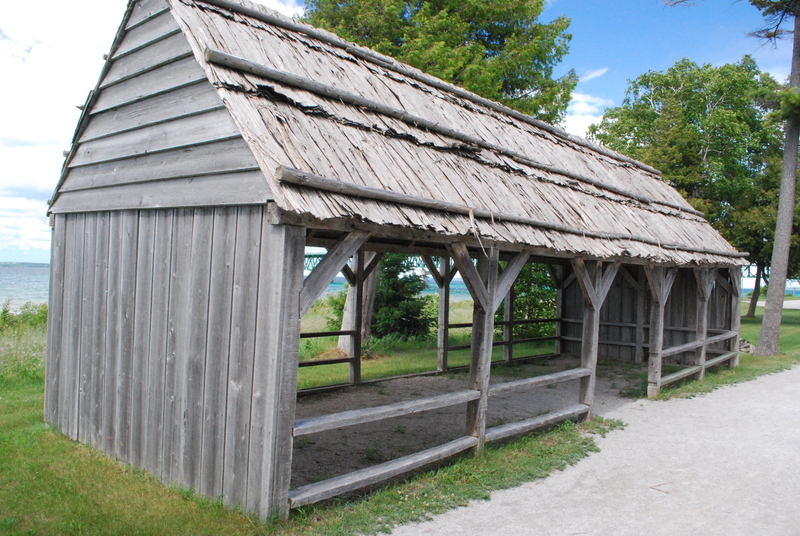 The first fort was built by the French at Mackinaw in 1715. Two battles were fought on Mackinac Island during the War of 1812. 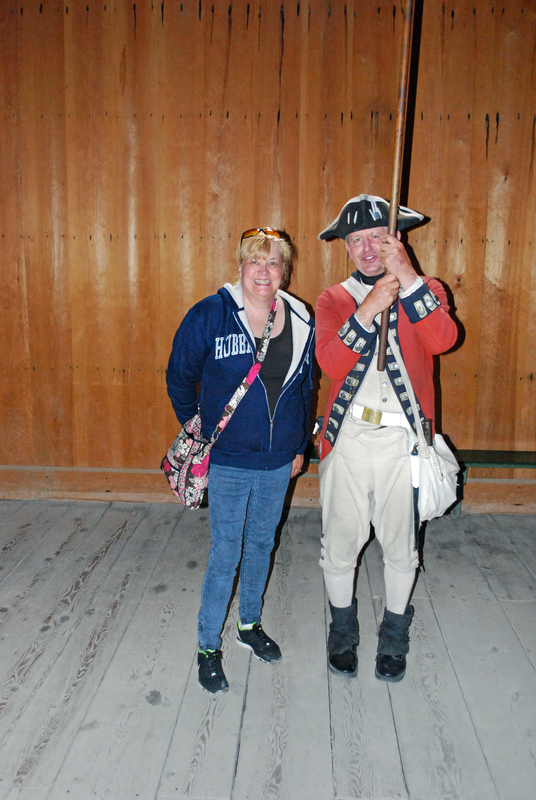 The British took over the fort at Mackinaw after a great victory in Montreal in 1760. They took control without firing a shot. They moved to Mackinac in 1761 after a victory in the French and Indian War because its high limestone bluffs and excellent harbor made for better defense. They had grown concerned that the Americans were going to attack and that was the reason to move the Garrison. The King’s 8th Regiment was garrisoned there. During the American Revolution the British burnt the fort at Mackinaw to the ground and moved their defense to Mackinac’s bluff’s. In 1783 the Americans had taken possession of the fort but the British again captured the fort in the War of 1812. The Jay Treaty gave it back to the Americans in 1815. During the British occupation, the Indians did not trust the British. They considered the Indians a conquered people. They considered the Indians and half breeds as savages. Take for example, the tragic love affairs of Sophia Biddle. 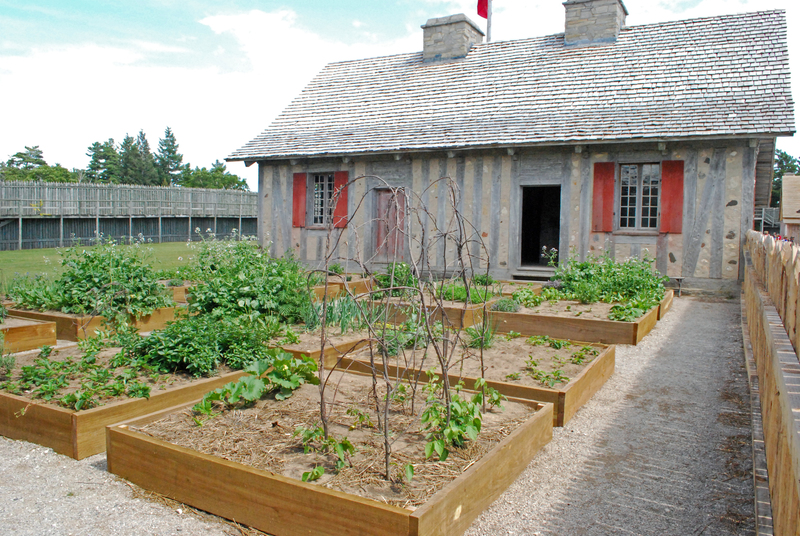 Her father, Edward and mother, Agathe Lavigne owned a fur trading center in the small village. They wanted a good education for their beautiful daughter so sent her away to her uncle where she became very sophisticated. She spent the seasons in Detroit where she met a young officer named John C. Pemberton. 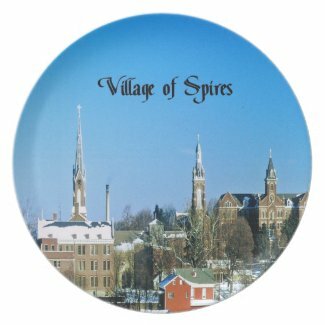 He despised Mackinac Island and said it was a godforsaken outpost with nothing but savages and half breeds. He was a very bigoted man. Little did he know Sophia was one of these half breeds. She fled back to her home on Mackinac Island so he wouldn’t find out the truth. When he came looking for her and found she was a half breed, he spurned her and sarcastically turned his back on her in disgust. Having a change of heart, he returned the next spring to see her, only to hear she had died of consumption and a broken heart. She is buried in the St. Anne’s Cemetery. This kind of distrust of the British led to Pontiac’s Rebellion in 1763-1766. The Native Americans waged war against the British and attacked Detroit. They were dissatisfied with the infamous policies of the British after the French and Indian War. The British were brutal in the treatments of prisoners, targeting and exploiting civilians caught in the middle. British officers attempted to turn the tide of battle by deliberately infecting the Indians with blankets riddled with the small pox virus. The treachery and ruthlessness drove a wedge further between the Indians and the British. They also refused to give them free ammunition as the French had done and treated them arrogantly. They built forts and allowed white settlers upon the Indian land. The French had cultivated alliances with the Indians, traded with them and even intermarried with Indian women. When the British took over all that changed and everything from then on turned sour. The Indians joined together to drive the British from their land. Pontiac gathered the Ottawa, Potawatomi, Ojibway and Huron Indians into one confederation. The French had vacated the fort in 1761 but the French civilians encouraged the Indians to drive out the British. In 1763, the Mackinac fort was attacked and most of the British killed. The Indians had used the ruse of playing a game of Bagataway (Lacrosse) in front of the fort. A ball deliberately was knocked into the fort as the soldiers watched the game in interest. The Indians all raced into the fort after it and the women handed them their weapons hidden under their blankets. The unsuspecting soldiers were killed but the French were left unharmed. Alexander Henry, a British subject had been urged by Jean Baptist Leduc to go in trade with him at Mackinac. When he landed he was met by 6 warriors with tomahawks in one hand and scalping knives in the other. He hid for a while in the attic of Charles Michel de Langlade but they were afraid they would be punished for harboring him as a blood brother sometime before and hid him for safety in Skull Cave. It was dark and Alexander laid down on leaves and brush for the night. He felt something sticking him in the back and the next morning in the light of day realized he was sleeping on human bones. Because of Pontiac’s lack of success in capturing Detroit the British took over the fort at Mackinac again in 1764. After the French and Indian War in 1780 the British still controlled the fort. In the War of 1812 the British and Americans fought over the Island. The Americans gained control with the Jay Treaty. In the 19th century, tourism was given a boost. The Federal Government declared the Island as protected land. This limited the development and set building restrictions as to preserve the natural beauty of the land. Writers found the area and described its beauty and Victorians flocked to the Island in droves. It became one of the nations most favored resorts. They traveled by excursion boats from Cleveland, Detroit, Buffalo and Chicago. In 1887 The Grand Hotel was built. Summer cottages were also constructed for tourists who wished to remain for a while upon the Island. They danced to the music of Strauss’ Waltzes, listened to the great Marches of Sousa. They dined on delicious whitefish, and strolled along the decks and romantic beaches. Social activities included, tennis, bicycling, hiking, swimming and examining the Islands natural wonders. Later on a golf course was built. During the Great Depression tourism fell off but picked up again after World War II. The Island has attracted great political figures such as presidents and governors. Two movies have been made there, “Somewhere In Time” and “This Time For Keeps” starring Ester Williams. Thousands of tourists still visit Mackinac Island each year. Second for FISHING, Third for FUN and now-days for FUDGE. At this period of time in the history of man, there is probably more individual searching being done into the theories behind the origin of the human race,what happens after death,the possibility of life on other planets, and what our relationship is to these life forms, if they do exist. There are millions of people who are questioning the existence of God, who he really is, and what is my relationship with him? Is he someone who mysteriously floats around on a cloud watching and judging us from above like some bigger than life Santa Claus, or is he, like many of the esoteric sciences claim, a part of our inner Self, whom we have constant contact with, someone whom we and everything in the universe are connected and are thus one? Each of us in our own way is experiencing what God is, and thus we are each a part of God, thus we are God! This book is a brief account of my search for my own truth. The pride of every Michigander , The Mackinac Bridge stands out as one of the marvels of northern Michigan. In ancient times , the Ojibwa tribe considered the area to be sacred. The Algonquian peoples, the Native Americans who lived in the straits area prior to the arrival of Europeans in the 17th century called this region Miciliamac, which is widely understood to mean the Great Turtle presumably named for the shape of Mackinac Island. I’m not sure since airplanes hadn’t been invented yet, they knew it was shaped like a turtle. That is easy to understand , because of the beauty, peace and calm surrounding the island and landscape, there is much reason to believe they were correct. Opened on November 1,1957 , it spanned the straits of Mackinac to connect the upper and lower peninsulas of Michigan. The bridge is currently the fifth longest suspension bridge in the world and the longest in the western hemisphere . All suspension bridges are designed to move to accommodate wind, change in temperature, and weight. It is possible that the deck at center span could move as much as 35 feet (east or west) due to high winds. This would only happen under severe wind conditions. The deck would not swing or “sway” but rather move slowly in one direction based on the force and direction of the wind. After the wind subsides, the weight of the vehicles crossing would slowly move it back into center position. The steel superstructure will support one ton per lineal foot per roadway (northbound or southbound). Certainly one of the most pristine locations in the United States, Mackinac Bridge is surrounded by natural beauty. Enjoy taking the photos you like with this handy dandy camera!